Madhyamaheshwar is situated in Kedarnath Wildlife Sanctuary (world's richest bio-reserve). Its a close copy of Tungnath and is situated at a lower altitude below the tree line. It's one of the Panj-Kedaras (Five Kedars). It lies in the foothills of Chaukambha (7140 meters). Budha Madhyamaheswar or old Madhyamaheshwar is a tiny shrine some 250 meters above Madhyamaheshwar on a ridge. The views on top of the ridge are splendid as Chaukambha and its appurtenant peaks tower above us. Their are tiny ponds which reflect the snow peakS in great detail, a view that will leave you spell bounded and feel blessed. The beautiful views are intoxicating and provide a great joy and high to the trekker. Madhyamaheshwar is situated at at altitude of 3500 meters and is the fourth temple to be visited in the Panch Kedar Pilgrimage Circuit, the first three being Kedarnath, Tungnath, Rudranath and the fifth one Kalpeshwar being visited after Madhywamaheshwar. The middle part (navel) of the bull, considered to be a form of Shiva which he took to hide from Pandavas as they were searching for him, is worshipped here. The temple is believed to be build by Pandavas the heroes of the epic Mahabharata. The temple is situated in picturesque green valley and surrounded by snow peaks including Neelkanth and Kedarnath. The Kedar Massif offers a spectacular view of formation of numerous glaciers including the source of Mandakini River. The rich flora and fauna including the rare Himalayan Musk Deer also called Kasturi Deer is found in the Kedarnath Wild Life Sanctuary. For details about Haridwar please refer to our Dodital and Yamunotri Trek. From Haridwar there is a 200 kilometer journey to Ukhimath via Rudraprayag. 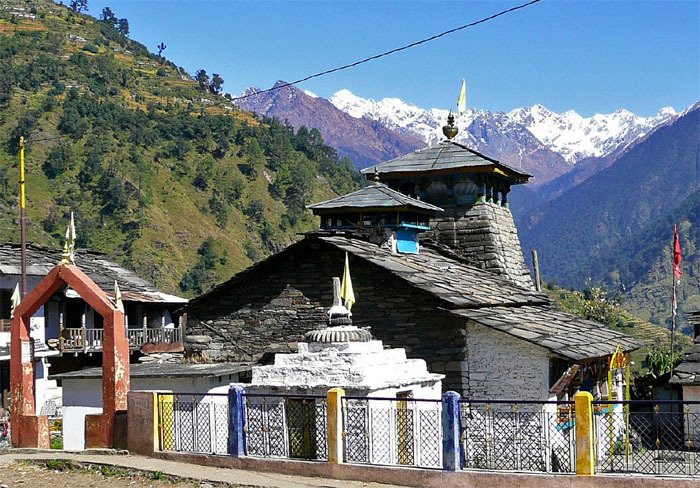 Ukhimath also called Okhimath is a pilgrimage site in Rudraprayag district. 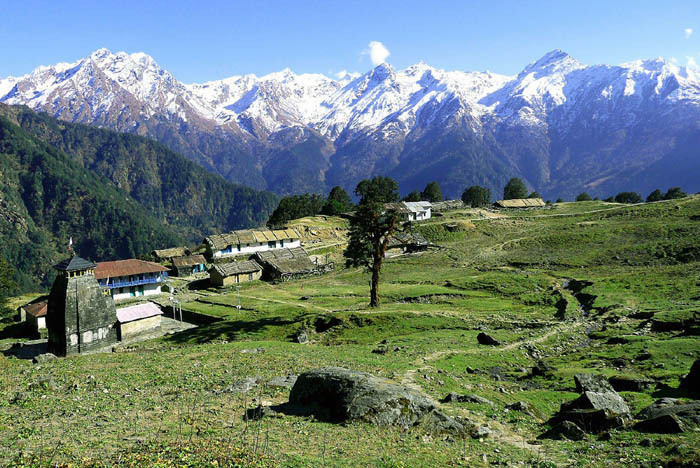 It is at an altitude of 1300 meters and 40 kilometers from Rudraprayag. Ukhimath is a central destination for visiting different places like Madhmaheshwar (Madhyamaheshwar), Tungnath and Deoria Tal. Wedding of Lord Krishna's son Anirudh and Usha, daughter of demon Banasur was solemnised here thats why its also called Ushamath. Idols from Madhyamaheswar and Kedarnath are bought here in Winters as the route closes due to snow and worshipped in Okhimath. There is a temple of Lord Omkareshwar here which is worshipped by great fervour by devotees thronging all year round. From Ukhimath there is a 23 kilometer ride to the village of Uniana (1700 meters) from where our trail to Madhyamaheshwar begins. There is a road construction underway till Ransi, which is 3 kilometers ahead of Uniana. There is a small temple of Rankeshwari Devi at Ransi with interesting sculptures. The stretch is uphill and somewhat dusty but soon turns into an ideal trail as we descend into the forests along with the river. Halfway through the trek while walking along some switchbacks inside dense forest, we will come across a small waterfall flowing over a black granite formation. The path is leveled by now and then gradually descend a little to c0me across another roaring waterfall along a bridge. From here the path climbs again and we are greeted with numerous waterfalls and beautiful green landscapes till we reach the settlement of Gondhar. We will halt here for rest and refreshments. Another few kilometers walk from here as we will cross a confluence of Saraswati River and Madhyamaheshwar Stream and some climb will take us to Bantoli. The views from Bantoli are exhilirating as we will click magnificent view of the confluence of Madhyamaheshwar Ganga and Morkhanda River. There is a guest house offering fine views of the river and Mandani Peak (6200 meters). We will rest here tonight. Today we will walk over a well graded path and enjoy changing views of grassy slopes, beautiful streams and wide snow covered peaks while walking along dense forests. The forest will become dark as we will trudge along which can be a bit uncomfortable. The route is full of dried leaves, mud and tree roots at unpredictable places. However it will be spread with lovely flowers of various colors. From here the climb would be steep and it would take us a few hours to reach Madhyamaheswar meadows. The temple is situated at a depression in the far end of meadow along with a cluster of establishments. There is a beautiful aarti which is performed at Madhyamaheshwar in the evening. Several people chant mantras on ice cold stone slabs. The Lingam is covered with conical brass material with carving of a face with moustache. There is a guest house near the temple and accomodation and meals are provided inside the temple complex. It's advisable to begin Budha Madhyamaheshwar trek in the morning and reach before noon since after that it's surrounded with clouds marring the view and cold winds make prolonged stay uncomfortable. The climb of Budha is nearly 1-1.5 hours to the top of the ridge and the sights from the top are breath-taking as it hosts a delectable meadow and plenty of spots to admire Chaukhambha, Mandani Twin Peaks and Kedar Dome. It's best to spend the better part of the day here rest and admire the views as in the evening we will climb down to Madhyamaheshwar. This is a rather strenuous stretch but well worth the effort. Kanchani Tal (lake) situated at an altitude of 4600 meters offer splendid views and experience. The path climbs from Kanchani Khal (4200 meters) from behind the temple and than leads to Kanchani Tal. It takes 8 or more hours depending on trekker's fitness levels and its advisable to camp near the lake for the night and return back to Madhyamaheshwar next day. Follow the same route and retrace our steps back to Uniana, while halting for a night at Bantoli. From Uniana our jeeps would be waiting for you to transport back to Ukhimath.